The development of a Members 1st Credit Union could lead to the extension of Carey Lane to Spruce Street. Over the years, Elizabethtown area residents and officials have discussed numerous ways to improve the traffic flow and safety on South Market Street, in particular the corridor from Kmart to Maytown Avenue (Route 743 that heads toward Marietta next to the Mount Tunnel Cemetery). I would add to that the backups that occur from that intersection past College Avenue during especially busy times. The Elizabethtown Area Regional Authority, formed in the past two years to implement a regional comprehensive plan, has identified traffic in that corridor as a priority that needs to be addressed. And the comprehensive plan itself focused on traffic as a critcal issue for the region. Carey Lane: Least expensive option, at an estimated $260,000. With the approved development of a Members 1st Federal Credit Union branch to be built on the southwest corner where the former Hiestand Flooring used to be, it seems to be an ideal time to make this happen. Most of the development sits in Mount Joy Township, with a sliver of it in the borough. The vast majority, if not all, of Carey Lane would be in the borough. Thanks to the development in the township, Members 1st would pay impact fees of about $71,000, which could fund a significant portion of the construction. Extending Maytown Avenue (Route 743) through to Spruce Street: This would require purchasing and demolishing properties. Estimated construction costs: $350,000. Constructing a bridge that would connect South Mount Joy Street behind Kmart: This has been a topic on Borough Council for years and in fact was voted down by a previous council. Estimates that the borough obtained several years ago have this project costing $1 million. One-way traffic option: Even at an estimated $600,000, this intially seemed like a viable option because it would have used exisiting streets and if was creative. But Borough Council put the brakes on the idea only a couple of weeks after EARA discussed it. With Carey Lane as the least expensive option, and with the Members 1st development, it seems like the perfect situation to find a solution to the congestion on South Market Street. Last week, at a regional meeting among all elected officials -- not just EARA board members -- we discussed and began to focus on the plan. To help reduce cosntruction costs, the consensus was to eliminate two-way traffic on Carey Lane, with drivers only permitted to come out to Market Street. Those on their way back into town would continue on Market Street and make turns at Groff Avenue, Spruce Street or continue on Market. This plan is far from a done deal. That said, it is on Borough Council's and Mount Joy Township's radar to continue discussing it. 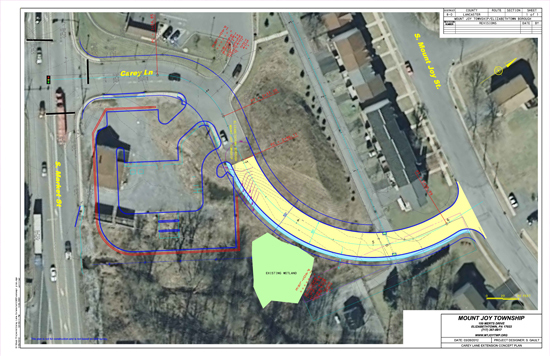 In fact, we expect to see some revisions to the plans showing Carey Lane as a one-way street (traffic would still be two ways at the light itself to allow for traffic to exit the bank and the credit union). Thanks for blogging about this and for trying to find a solution. I'm trying to understand how this would relieve traffic pressure from Market. Would the idea be that people would use Mount Joy St to get out of town? Adam: The intent is to get traffic off Market Street by having traffic from our neighborhood and the areas on the other side of East High Street head down Mount Joy Street. The traffic engineer who has been working on this says the intersection of Market and Maytown Road (by the cemetery) has a grade of an F because it's so busy and congested. His calculations say Carey Lane would bring that grade down to an acceptable C.